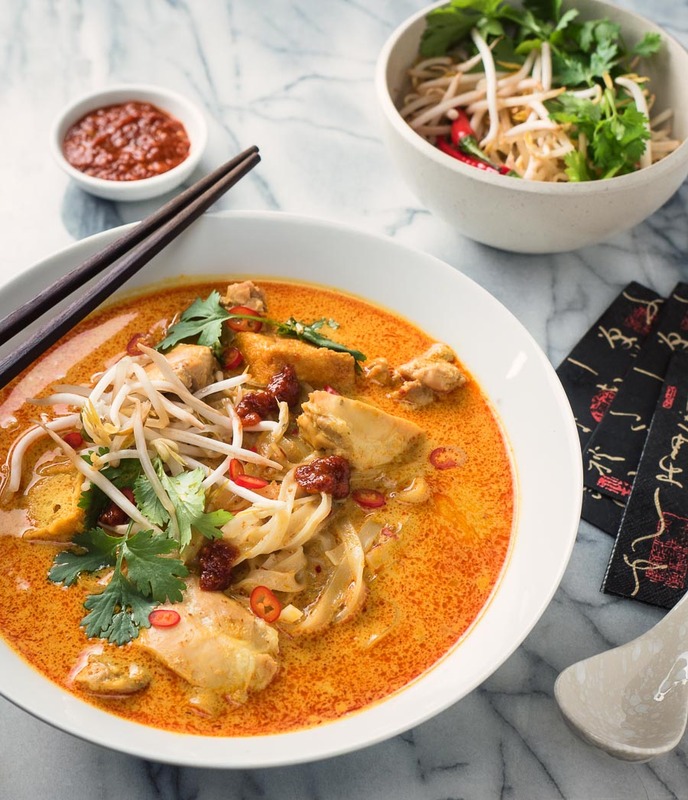 Laksa is a spicy coconut noodle soup that needs to be in your repertoire. Creamy. A bit spicy. Great southeast Asian flavours. It just screams delicious. I don’t know why it isn’t more popular. There’s about 3 million pho joints where I live. And about 5 places that serve laksa. I love pho. A lot. But laksa is a great Asian noodle soup too. It deserves to be on a menu near you. The dish comes from Malaysia. Singapore laksa is pretty big too. The tastes are pretty close to Thai. 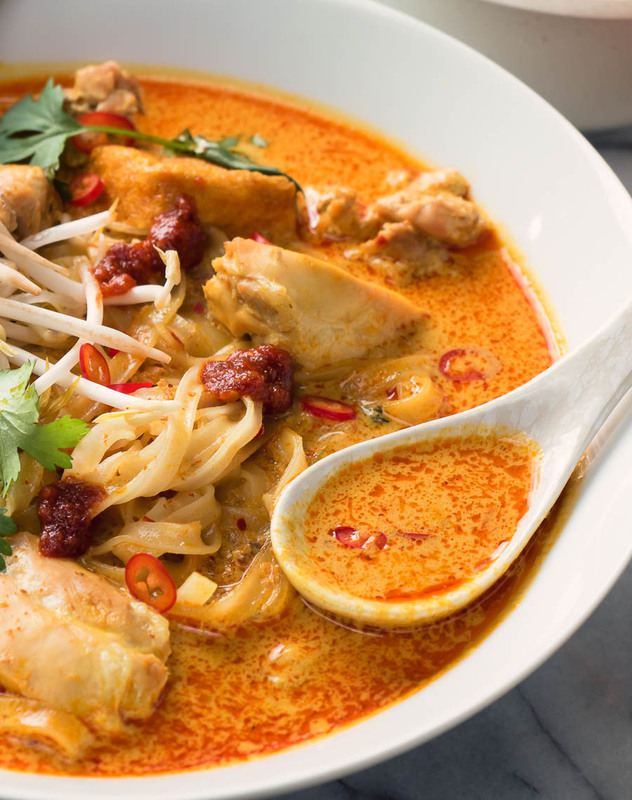 If you like Thai and you like noodle soups you will love this. No doubt in my mind. I’m cheating a bit with this recipe. It is not from scratch. I’m using store bought laksa paste. You can make your own but if you take a little care the store bought stuff works well. Much easier. Moves into Tuesday night dinner territory. You need to be a little bit organized but it’s totally doable. I don’t usually go for store bought, pre-fab stuff. But in this case I am good with it. Even with the paste this is a seriously tasty stuff. Different to me anyway. I have never really come across tofu puffs in anything but laksa. I remember my first bowl of Singapore style laksa. Wasn’t sure what I was eating but it was like this bite of soup but with texture. Hard to describe. Tofu puffs soak up the soup. They are kind of like a tofu sponge. That’s not the most appetizing description. But it’s accurate. They don’t taste like sponge though. Not that I eat a lot of sponge but I’m pretty sure. You are likely going to need to go to an Asian market to get the paste. While you are there poke your nose in refrigerated section. You should be able to find fried tofu puffs. Not a super mainstream ingredient but an interesting garnish the traditional dish. I like them but as a garnish. An interesting textural addition. Not sure I want 10 of them in my bowl. But one or two adds a little something extra so I include them in this recipe. Try them. Rice noodles in hot soup is a tricky thing. You have to cook them just enough so that they can finish cooking perfectly in the soup. Underdone and they are tough. Overdone and they are mush. There’s an easy way to make sure your noodles are done just right. This is how they do it to order in restaurants. Soak your rice noodles in cold water for around 30 minutes. Have a big pot of water boiling on the stove. Place the soaked noodles into a large strainer (a pasta pot works really well here). Cook the noodles for 30 seconds. Test one. Keep testing. Somewhere between 30 seconds and a minute the noodles will get chewy but not hard. Pull them and use immediately. Remember they will cook a bit more in the hot soup. The quick and dirty chili sauce is one I came up with because I was out of Vietnamese sate sauce. And I wound up liking it. So I’ve included it here. But the Vietnamese sate sauce is also really, really good if you feel like going the extra mile. Or you have some kicking around your fridge. Big, bold flavours. Creamy. Coconut. Easy to make. Deeply satisfying. 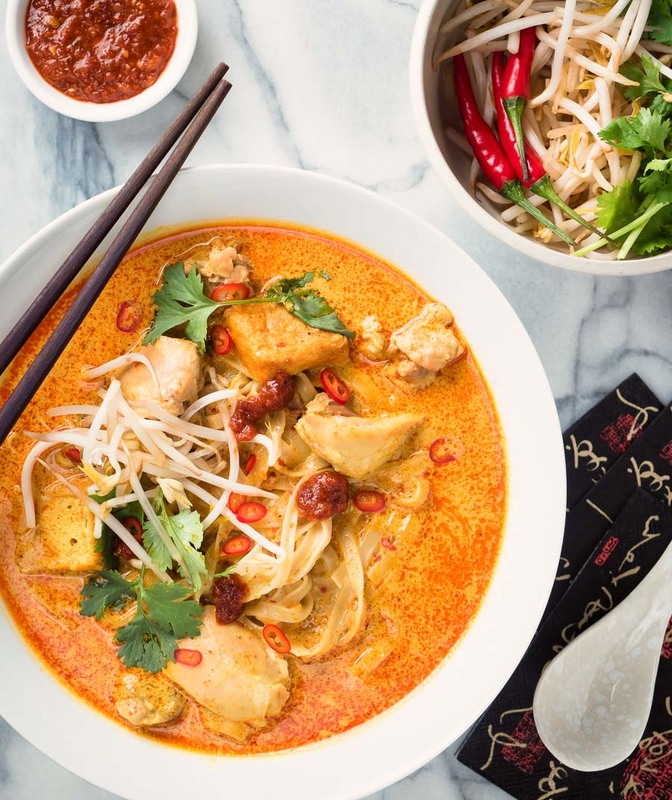 There is nothing not to love about laksa. Try it. You won’t be sorry. Soak the noodles in cold water for 30 minutes or so. Make sure they are fully submerged. Drain and set aside until you are ready to serve. Place the chicken in a saucepan along with the chicken stock and fish sauce. Bring to a simmer and cook the chicken until it reaches an internal temperature of around 165F. This will take about 20 minutes for the boneless chicken thighs. Takes a little longer for bone-in. Remove chicken from the stock, shred or cut into bite size pieces and set aside. Set aside the chicken stock in another bowl. Set a large pot of water on the stove and bring to a boil. You will be flash cooking the pre-soaked noodles. Time it so it's at a rolling boil right when you are ready to serve. Open the can of coconut milk. Have it ready. Heat a saucepan large enough to hold about 2-3 quarts over medium heat. Add the oil and then the laksa paste. Cook the laksa paste, stirring frequently, for about 1 minute. Add the turmeric and chili powder and cook for another minute. Watch it closely. It can burn at this point. Spoon the thick coconut cream out of the can into the saucepan and stir to combine. This is about the top 1/4 of the can. Cook for about a minute. Add the rest of the coconut milk and the chicken stock. Stir and bring to a simmer. Add the tofu puffs if using and cook for 5 minutes. Add the chicken and cook until warmed through. This takes about 2-3 minutes. Drop the noodles into the boiling water. Cook for 1 minute and drain in a colander. To serve, divide the noodles into two bowls. Spoon the soup overtop. Garnish with bean spouts, cilantro and red chilies. Serve the chili sauce along side. In main course, noodles, poultry, soup. Bookmark the permalink. Made this on the weekend. Terrific! Glad you liked it. I love a good bowl of laksa! 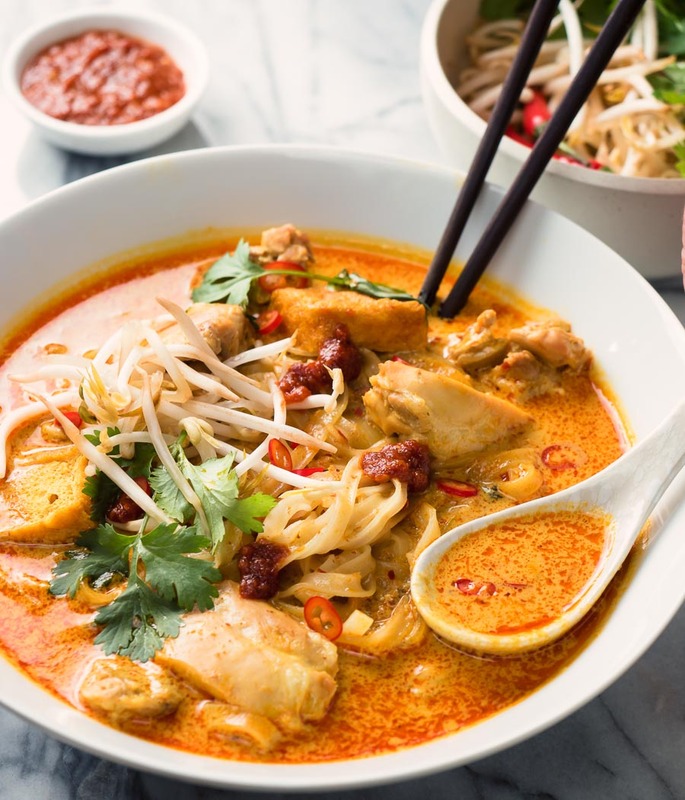 We used to live in the NT of Australia and laksa was a staple for us! 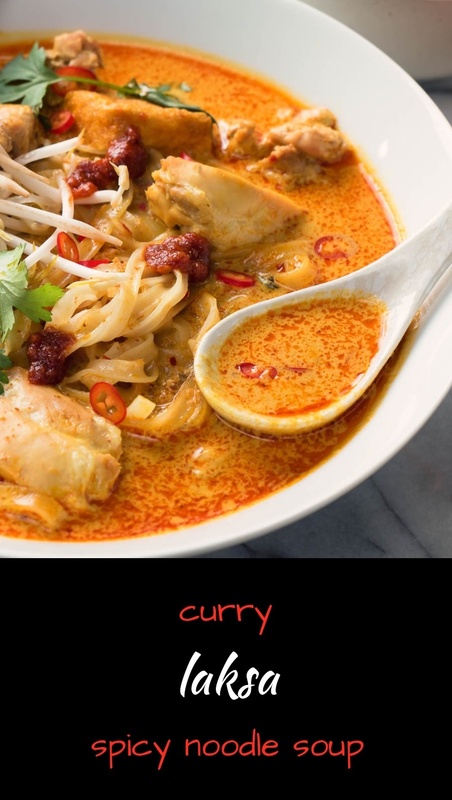 What brand of laksa paste did you use? It’s addictive stuff for sure. I use Por Kwan brand. It’s the best one I’ve found. Made this for dinner last night. It was a big hit with the whole family! Thanks! That’s great! Glad to hear it.